New Media Campaigns recently developed and launched http://www.keepthebellringing.org for the Salvation Army of Wake County. Springboard Eydo, an agency partner, provided the excellent layout design that we incorporated into our content management system. Although the Salvation Army's website features are many, I want to focus on one feature in particular — the calendar. The Salvation Army of Wake County website includes a monthly calendar that may be paginated into the past or future. Each calendar cell (representing one day of the current month) contains a list of events, similar to Apple iCal or Google Calendar. When you click an event link, a modal window appears featuring details about the selected event. This calendar is the result of carefully woven design, HTML markup, CSS styles, and jQuery scripts. We developed The Salvation Army website using the XHTML 1.0 Transitional DTD. In most cases, the markup will validate as XHTML 1.0 Strict. However, we opted for the Transitional DTD since a majority of the website's content is provided and controlled by the client. Here is a sample of the calendar's markup. Yes, we used a table for the calendar markup. A calendar is, in fact, tabular data. Week days (Sunday, Monday, Tuesday, Wednesday, Thursday, Friday and Saturday) are table columns, and days of the month are table cells. We added meta annotations to the calendar markup in the form of class attributes. For example, we annotated table cells with classes like calendar-cell and calendar-cell-weekend. Our CSS is clean and easy to understand. This simplicity is the result of well-annotated HTML markup. By annotating our HTML markup, we can quickly and easily isolate and style the appropriate calendar elements. The calendar behavior was created using jQuery and Thickbox. Here is the relevant snippet from the HTML markup above. We annotated the hyperlink with the thickbox class. When the link is clicked, a Thickbox modal window appears and loads the referenced resource with AJAX. 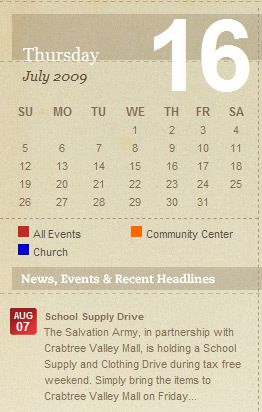 We also provided a mini calendar that is used throughout the rest of the Salvation Army website. You can see this mini calendar on the home page in the left column. The Salvation Army website and calendar demonstrates how New Media Campaigns merges design and programming to create stellar user experiences. Head over to our portfolio to view more of our work. Good to see somebody recognizing that a calendar is, in fact, tabular data. It's so hard to get people to recognize that there ARE legitimate uses for tables. Of course I also know that there are illegitimate uses for them but that doesn't mean the legitimate uses go away. This is not Full Calendar, this runs on the server. If you can get away with a client-side calendar, we suggest Full Calendar and have a great experience with it.